The face is a reflection of the body’s state of being & reveals a blueprint for balance. All of the latest research is showing how all roads of ‘dis-ease’ and imbalance lead to inflammation or abundance of toxic heat in the body, consequently affecting the cellular matrix. It is the result of everything being considered a catalyst to aging, such as sun, alcohol, and stress — all of which increase the heat and cultivate a sort of ‘global warming’ in the face and body. Although a body in balance is comprised of about 75% water, the toxic heat triggers evaporation of those precious cellular waters — leading to dehydration and compromised metabolic function, including healthy cell turnover and fatigue... think of the difference between a perky grape and a tired raisin. The good news is that there are ways to achieve balance quickly to offset the stress of daily life with immediate visible results. The face is a blueprint for balance, containing over 40 muscles and acupoints that restore radiance to the overall appearance, and deliver a ripple effect of nurturing, restorative wellness to the whole being. It is an innovative way to approach inner beauty with energizing results. 1. Beginning in the jaw area using uplifting movements, start pushing and rolling with firm pressure using the pads of the fingers to grip the face muscles. 2. Moving just above the cheekbone underneath the eye area, move the pads of the fingers in a ‘half moon’ motion from the inner corner of the eye outward toward the hairline. 3. Grip, pinch, and slide across the eyebrows from bridge of nose outward toward temples & repeat a few times. 4. Using the pads of the first two digits, move from the inner corners of the eyebrows firmly up the center of the forehead to the hairline & repeat several times with firm pressure. 5. With firm circular motion, move to the temples and expand the circles to ultimately reach the hair and scalp next to the temples. Repeat several times and notice the release. 6. Using pads of middle fingers, one on top of the other, place them on the point just between the eyebrows, and move in a firm spiral motion inward toward muscle behind the skin. 7. Place fingers in center, just under the eye, on the edge of the cheek bone, moving with firm spiral motion. 8. Place fingers just under cheekbones with firm circular spiraling pressure. 10. Interlace hands to hold behind the neck, drop the elbows, and drop the head to release the neck — and breathe. Face Muscle Massage & Movement = 10 times the circulation to the surface of the skin, leading to a healthy radiant glow, better skin function & face detox. Acupressure = Activates the para sympathetic nervous system which sedates the body, lowers body temperature allowing for better cellular repair, balances systems in the body & softens lines. Head & Neck stretch = Releases visible tension of the face, opens up pathways of circulation to the front of the face, and is detoxifying. 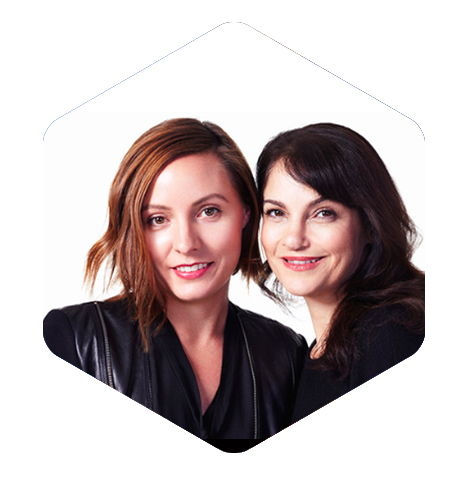 Rachel Lang (facialist) and Heidi Frederick (massage therapist), founders of FaceLove Fitness, are personal trainers for the face and activate inner beauty. FaceLove (founded in 2014) specializes in toning and strengthening the muscles of the facial area, which energizes the skin, creating radiance, cultivating a firmer skin structure with anti aging benefits, and elevates mood - which they call FaceJoy. Combined they have over 30 years in the beauty & wellness business, and are very passionate about holistic beauty maintenance being the logical fun way to amplify any skincare or beauty regimen. “The muscles of the face are smaller so it’s possible to see results in as little as 3 to 4 sessions,” says Rachel. “We believe muscle toning and massage are the most valuable skin care products you could have,” adds Heidi.